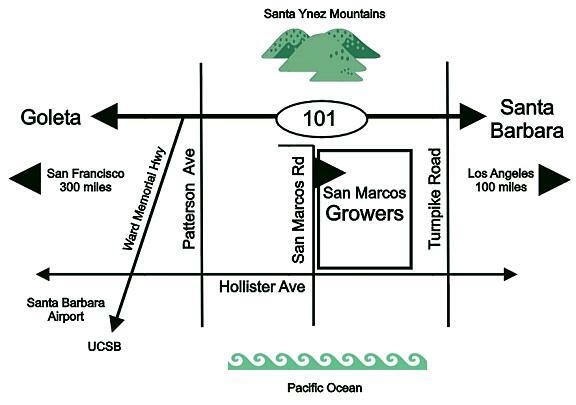 The nursery is located 6 miles north of downtown Santa Barbara on Hwy 101. Coming from the south use the Turnpike Road off-ramp and turn left on Turnpike Road towards the ocean to Hollister Avenue - turn right on Hollister Avenue and go 1 long block to South San Marcos Road and then turn right. If coming from the north use the Patterson Avenue offramp and turn right on Patterson Avenue towards the ocean to Hollister Avenue - turn left on Hollister Avenue and go 4 signal lights (~1 mile)to South San Marcos Road and then turn left. The main nursery entrance is on the right.